Job growth came in below expectations, as August's payrolls grew 173,000, according to this morning's jobs report from BLS. Private sector job growth was particularly weak, at 140,000, its weakest month since March. Wage growth remains tame -- remarkably so, given the low unemployment rate, which fell to 5.1% last month -- and the labor force remains historically low, suggesting significant numbers of potential workers remain on the sidelines, creating downward pressure on wages and a downward bias on the jobless rate. The unemployment rate, as noted, fell from 5.3% to 5.1%, the lowest rate since April 2008 and the rate that the Federal Reserve believes consistent with full employment in the job market. The labor force remained flat in August, meaning the participation rate is still stuck at a low 62.6%, more than three points off of its peak prior to the downturn. Some of that decline can be assigned to retiring boomers, but some remains due to persistently weak demand. The number of involuntary part-timers -- those working part-time who want full-time hours -- remains highly elevated at 6.5 million, though that trend too is moving in the right direction, down 700,000 over the past year. Thus, for the closely watched Fed decision as to whether they will begin their rate-raising campaign later this month, today's report poses a bit of a dilemma. The unemployment rate says "raise!" The payroll number says "hold!" What's the Fed to do? More on that in a moment. Job gains were particularly weak in goods-producing industries, down 10,000 in construction and 17,000 in manufacturing, which has been hurt by the strengthening US dollar That makes our manufactured goods less competitive abroad and so far this year, factories have added 28,000 workers, well below last year's pace of 119,000 by this point. Retail trade fell off of its recent pace, adding only 11,000 jobs after adding over 30K in the prior two months. Government employment, on the other hand, has added between 20K and 30K over the past three months, including 33K last month, largely in local education. Since the jobs data are seasonally adjusted, that implies an increase in education hires over the usual August bump you'd expect based on back-to-school activities. That raises the issue of revisions. First, the prior two months payroll numbers were revised up by 44,000 in total -- in the revised data, both June and July saw solid gains of 245K. Importantly, there's a pattern to August revisions, which have averaged almost 80,000 over the past five years, meaning that after the two monthly revisions, the original August payroll gain has been this much higher, on average. For today's number, that would mean a gain much in keeping with that of June and July. However, it's entirely possible that August's revision will go the other way, so the best we can do is downplay any one month's data, using the smoother technique I always feature in these write-ups. 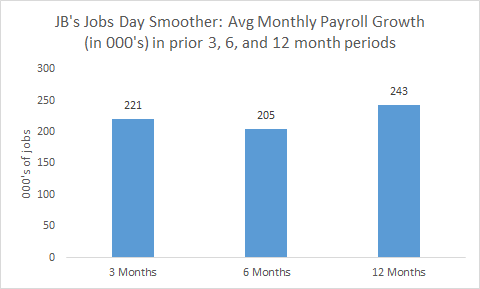 Averaging out the monthly payroll gains over 3, 6, and 12-month rolling averages, the smoother figure above shows that we're consistently adding over 200,000 jobs per month. That's a solid pace of gains, and while today's weaker number must be considered, given the statistical noise in these data, it should not at all be taken to suggest a shift in the trend you see in the figure. Average hourly wages, which despite low unemployment have been stuck at around 2% for years now, are up 2.2% year-over-year. That's over the past year, but has there been a more recent acceleration in wage growth? Nope. If we take an average of wage growth over the past three months, and compare it to the average over the prior three months, the annualized growth rate is... wait for it... 1.9%. Of course, everyone is watching today's report to see how it might influence the Federal Reserve's pending decision re the craze to raise. Distilling a lot of buzz, the consensus seems to be that a strong payroll number -- say, something north of 200,000 -- would clear the way for a mid-September liftoff, while a weak number would push the move to December if not later. While I don't believe a quarter-of-a-percentage point would be a big deal in terms of slowing the economy (the perspicacious Tim Duy disagrees), I've long scratched my head about why the Fed seems so driven to raise rates. Certainly neither price nor wage pressures are pointing in that direction, and the strengthening dollar amidst global weaknesses points the other way. But I'm particularly hard-pressed to see how one month's jobs data would seal the deal. While there's of course important information in these jobs reports -- if there weren't, I'd still be at home blogging in my jammies -- the signal-to-noise ratio is low in such high-frequency data. Significant revisions will be made. Yes, August's jobs numbers tend to be revised up, but when we're talking about a fundamental change in the economy's key interest rate, a one-month's jobs number is a small drop in what should be a big bucket of lots of other indicators. So, should they listen to the jobless rate telling them we're at full employment or the weaker payroll number (which may well be revised up), quiescent wage and price growth, ongoing slack signified by the depressed labor force rate and the elevated number of involuntary part-timers? That's actually an easy one. We're clearly not at full employment so, especially given the absence of price and wage pressures, the correct answer is to hold for now. Either 5.1% is an inaccurate estimate of the "natural rate" -- which is actually lower than that -- or the reported jobless rate is biased down by some of the factors noted above. Either way, for a data-driven Fed, it's the same answer. For a Fed driven by other stuff -- emotions, ennui, nervousness ("let's just raise the damn thing already and break the suspense! "), nightmares from the late 1970s, or whatever... well, that's a different story.